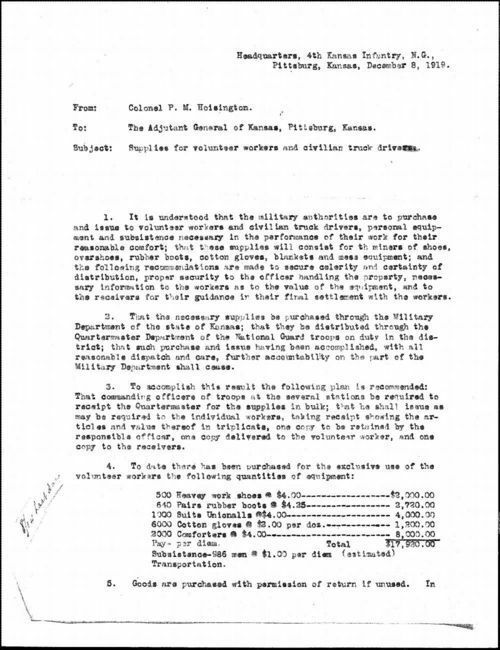 In this letter, Colonel Hoisington, of the 4th Infantry, Kansas National Guard, informs the Kansas Adjutant General of supplies and cost related to the use of volunteers during the 1919 coal strike in southeast Kansas. Volunteers were brought in to work in all areas of the coal mining industry. The governor's goal was to assure that individual families, towns, and businesses received coal shipments in a timely fashion.